We offer high performance metering equipment for plastic injection, extrusion, or blow molding operations. From the ruggedly constructed, solid steel housing to the precision controls, this system gives you years of accurate, repeatable results. All feeders have Calibration Ports to draw samples without process interruption. The outboard hopper and port allow independent metering of material for easy samples. Our Standard Feeders use augers from 1/2” diameter to 2” diameter and have ten hoppers to choose from. 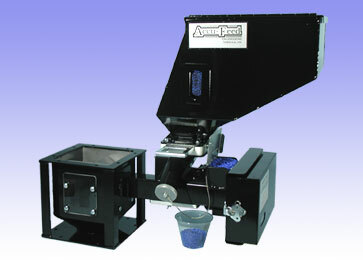 Our Mini-Feeders use augers from 1/2” diameter to 1 3/8” diameter and have three hoppers to choose from.